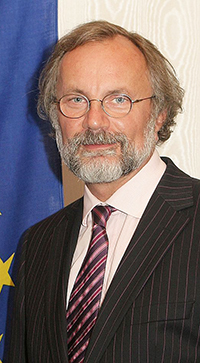 EU Ambassador to South Korea Michael Reiterer will deliver a welcoming speech as ECCK Chairman Dimitris Psillakis, president and CEO of Mercedes-Benz Korea, will host a forum on South Korea and Europe's future cars in a Seoul hotel on March 28 (Wednesday), 2018, ECCK has recently announcement in its news release. The European Chamber of Commerce in Korea or ECCK for its acronym will host the business form under the title of "The Future of Mobility Will Be Cleaner and Smarter" at Conrad Seoul Hotel in Seoul's Yoido area. The forum starts at Conrad's Studio 1-3 on its sixth floor at 8:30 a.m. on the day. But registration will begin at 8:30 a.m. The event will be co-hosted by the European Automobile Manufacturers' Association (ACEA) and the Korea Automobile Importers and Distributors Association (KAIDA). The EU-Korea auto forum will be joined by well oever 100 experts and business executives including ACEA Sec. Gen. Erik Jonnaert, KAIDA Vice Chairman Yoon Dae-Sung, and executives from Daimler and Scania. A congratulatory remark will be delivered by Mr. Kim Young-Sam, deputy minister for trade and investment of South Korea's Ministry of Trade, Industry and Energy. 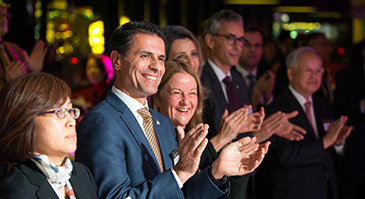 ECCK Chairman Dimitris Psillakis (2nd from left), president and CEO of Mercedes-Benz Korea, appears at a Seoul gathering. They will discuss automobile's future technology of South Korea and Europe in the upcoming forum. ACEA Sec. Gen. Erik Jonnaert will deliver a key-note speech at 9:20 a.m. on the redefinition of mobility followed by the welcoming addresses by ECCK chairman and EU envoy. Three presentations will be made from 9:40 a.m. to 10:40 a.m. during the forum. First, team leader Cho Sung-Woo of Korea Automobile Testing & Research Institute (KATRI) will speak on safety evaluation on self driving. Senior Manager Sina Marek of Daimler will make a presentation on mobility of the future; self driving, car sharing, and electric cars. Mr. Alexander Mastrovito of Scania in Hong Kong will deliver a speech on the future of transportation including self-driving trucks on the roads. A panel discussion will follow the brief coffee break at 11 a.m. and at noon network reception will begin for half an hour.